It was December 2005 and Boris Johnson’s political career was over. His annus horribilis had reached breaking point. Amid lurid revelations about his colourful private life and extra-marital wrongdoings aplenty, Boris had been banished from a fresh-faced David Cameron’s shadow cabinet and had resigned as editor of the Spectator. Widely tipped for the top, Britain’s favourite political maverick now faced exile on the backbenches, destined for a future of mere witticisms on the periphery and irreverent appearances on Have I Got News For You. Or not. Fast forward seven years and ‘BoJo’ is back, triumphantly waving the Olympic flag at the closing ceremony of a wildly successful London Games. 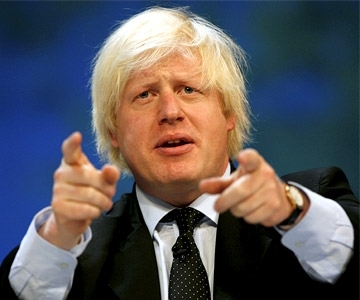 He’s the fair-haired phoenix of British politics. Whether it’s his infectious zeal or vibrant individualism, his rhetorical flourishes or his whole-hearted buffoonery, the London Mayor’s rejuvenation has been both remarkable and a pleasure to watch. One moment he’s hanging ridiculously from a zip-wire, dual wielding Union Jacks, the next he’s upstaging the PM with his dad-like dance moves to the Spice Girls. We lap it up. Anecdotal evidence of Boris’s boundless popularity is even staring me in the face as I write these words. A friend has just anointed Boris a ‘LAD’ on Facebook because, speaking about Prince Harry’s naked photos in Vegas, he said that the ‘real scandal’ would’ve been for Prince Harry to go to Las Vegas and ‘not misbehave in some trivial way.’ Right you are sir. The post already has 36 likes. 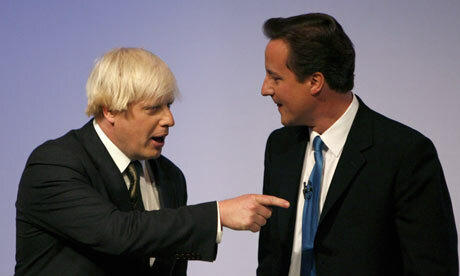 But no Bojo love-in is complete without the accompanying leadership gossip. Just like during his initial meteoric rise in British public life, you only need to mention the ‘B’ word and the ‘Boris for PM’ brigade is back in full swing. A recent Yougov poll gave the tantalising finding that more people would vote Conservative if Boris rather than Cameron were Tory leader, prompting commentators from across the political spectrum to openly entertain discussion of his chances of reaching Number 10. For right-wingers, BoJo is a potential Thatcher, a true radical who has the energy and charisma to lead Britain to greater things. For those on the left, he’s a man of the people who has his heart in the right place on issues such as the environment and sexual equality. What’s not to like? And yes, his supporters might argue, whilst Boris may have a few skeletons in the cupboard and is prone to the odd verbal gaffe, that’s not to say outsiders and mavericks like him can’t come to dominate politics. Just look at Benjamin Disraeli or Winston Churchill. Both men were marginal figures in the early parts of their political careers and, like Boris, had dabbled in the dark arts of journalism. Yet this didn’t stop them from becoming towering Tory statesmen in their ripe sixties. Reaching the top in British politics can be a marathon and not a sprint. Entertaining ‘Boris as PM’ thoughts like these is certainly good fun – just imagine how much more interesting politics would be! – but after sober reflection on the idea for more than a fleeting moment you quickly start to worry that it doesn’t quite add up. It’s time we had a serious talk about the London Mayor. Start with the source of his popularity. Why is it that people love him? I think it’s because he’s Boris. We love him, his spontaneity, his disregard for convention and conformity. We love his expression of English individualism and authenticity, his willingness to speak his mind and live life to the full. This is why the nation has taken him to its heart. But that’s the problem. Becoming PM is not about winning a popularity contest. It’s about a whole lot more. We want someone who will manage a coherent government that delivers excellent public services and who will defend British interests on the world stage. We also want someone with sound judgement and a vision for Britain, someone who will do what’s right and not necessarily what’s popular. Is Boris enough of a statesman to fill that role? Does he have such a vision and such backbone? I fear not. Then there’s the issue of his political beliefs. What does Boris actually stand for? He’s been getting an easy ride this summer because his activities have been strictly non-political. Waving a Union Jack and telling the world how great London is makes you few enemies. But what does Boris actually believe in? 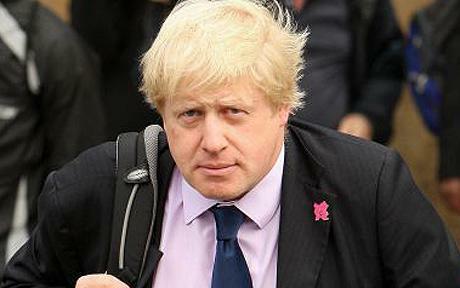 What does ‘BoJo Britain’ look like? We need to know. If he’s going to make it to Number 10 he’s going to have to first come clean to the nation on where he stands on the big issues – the NHS, crime, immigration, the economy – and all whilst keeping a straight face. Is that beyond him? Again, I worry. Which leads me to my final concern: I don’t think Boris can do ‘serious’. Jovial buffoonery is all well and good when it’s in the name of championing London but it’s not what we expect from a world leader. Boris needs to prove that, when things get serious, he’d be able to step it up a gear. We don’t want him cracking wise jokes with Putin or Ahmadinejad; the stakes are too high. We also don’t want him trivialising the office of PM by turning it into a Berlusconi-style soap opera. The question is ultimately whether Boris can make this transition from loveable London Mayor to hard-hitting, sensible Conservative leader. Only time will tell. So, Boris as PM? As much as I’d love to see it, unfortunately not yet. His personal popularity alone isn’t enough to take him to Number 10 and we don’t actually know what he stands for. He also hasn’t yet shown us that he’s a true statesman. It will take a while for the ‘village clown’ image to disappear. But, as his admirers will keep telling you, politics is a fast-changing world and Boris certainly has something special. If the Coalition implodes and the Tories take a dive, calls for a charismatic, popular saviour waiting in the wings won’t be far behind. Don’t write him off. You’ve got a long way to go Boris but the nation is rooting for you. Every once in awhile a priest says something that grabs you. This happened to me at Easter time and I’ve been meaning to post it here. These words come from Father Oswald Baker, a remarkable man who came to national prominence when he refused to say the New Mass after the Second Vatican Council. I found a pamphlet containing a selection of his sermons and this passage in particular really made me stop and think. One reason for much irreligion is that the discovery of religious truth is different from any other discovery. If a man learns something he did not know, in astronomy, chemistry, or geography, it makes no difference to his way of life, his pleasures or his morals. Religious truth involves oneself, one’s lifestyle, and personal obligations. To accept the existence of God will mean acknowledging obligations towards God. What is likely to keep men away from religion is not the truths we accept, the Creed, but the commandments bound up with the Creed. Religion is not just a subject for discussion. It is a subject for decision. The claims of religion are not a challenge to intelligence, but a challenge to character. It is not a question of brains but a question of courage. A man not courageously and honestly willing to accept truths involving obligations is not able to reason well on religion. He will astutely fit his creed to the way he lives. Belief and morals are interactive. I fear this line – ‘A man not courageously and honestly willing to accept truths involving obligations is not able to reason well on religion. I fear it because when I think about religion in my doubting moments, this is what’s holding me back. There are enough sound arguments – cosmological, historical, teleological – in favour of the existence of God to make possession of a faith reasonable. The deal-breaker is therefore not a question of reason but, as Fr Baker puts it, a question of character. Are you prepared to live a life of faith? To carry a cross?